The merger between United Airlines and Continental created the world’s largest airline. 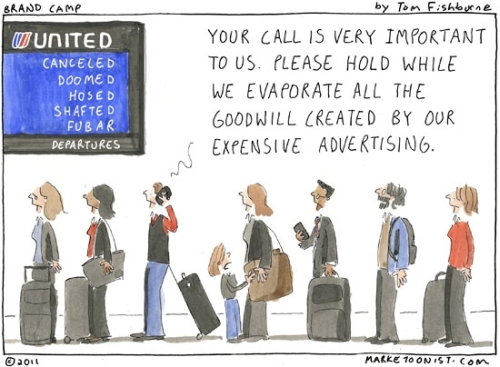 However, service problems and poor execution have led to increasing complaints against United, which has long suffered from a negative reputation among customers. Mr. Smisek said in April there was a “silver lining” of the troubled system conversion: United discovered “deficiencies” in how it had dealt with customer service before the switch, and that fixing them will improve service. Awareness that a problem exists. To improve, one must first recognize that a problem exists; after all, if there is no problem, then nothing needs to change. Accepting responsibility for creating the conditions that caused the failure. Merely speaking nice words has little value. To gain benefit from failure, one must accept responsibility for the failure itself — when in doubt, see step one. Dedicated commitment to improvement. Having recognized the problem and accepted responsibility for causing it, the next step is commitment to change. Without commitment, improvement is impossible. Although failure always offers an opportunity to learn and improve, Smisek’s comment suggests little sense of accountability or responsibility. Smisek appears to speaks of failure as an abstract occurrence for which he holds no accountability. It is also hard to believe that he was unaware of United’s “deficiencies” prior to the system conversion, making the comment seem disingenuous. Companies that genuinely learn from failure are worthy of respect and admiration; unfortunately, learning is harder than merely talking. It is not just that the conditions must exist, these three tenets must exist as part of the culture, especially the culture of the executives and the management (both IT and PMO). implementing the merger of the disparate systems. I would not want to be a PM on this project.